Pick up straw bales at your local Farmers Coop and Noah’s Pet in Fayetteville. Straw has many uses in the in the fall and winter months. Create your autumn lawn display or use as extra seating around the bonfire. 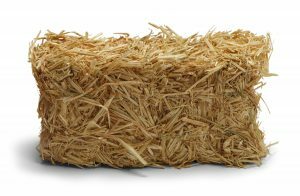 Straw bales can be used as animal bedding, to add extra warmth as the temperatures cool. It is not recommended to use straw as an equine bedding, as horses may eat it, causing digestive problems. Got bare spots in your yard or around the barn? Put some straw down to keep the mud to a minimum. Pick up straw bales and other supplies at your local Farmers Coop and Noah’s Pet & Wild Bird. And come springtime, if you have any of these bales left in the barn, try Straw bale gardening. This entry was posted on Thursday, September 27th, 2018 at 8:17 am	and is filed under News & Updates. You can follow any responses to this entry through the RSS 2.0 feed. Both comments and pings are currently closed.